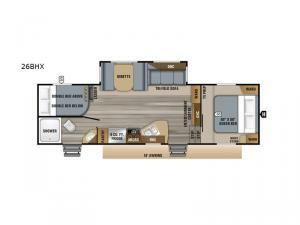 Hop into this luxurious Eagle HT 26BHX fifth wheel by Jayco. Your kiddos are sure to enjoy the double bunk beds. 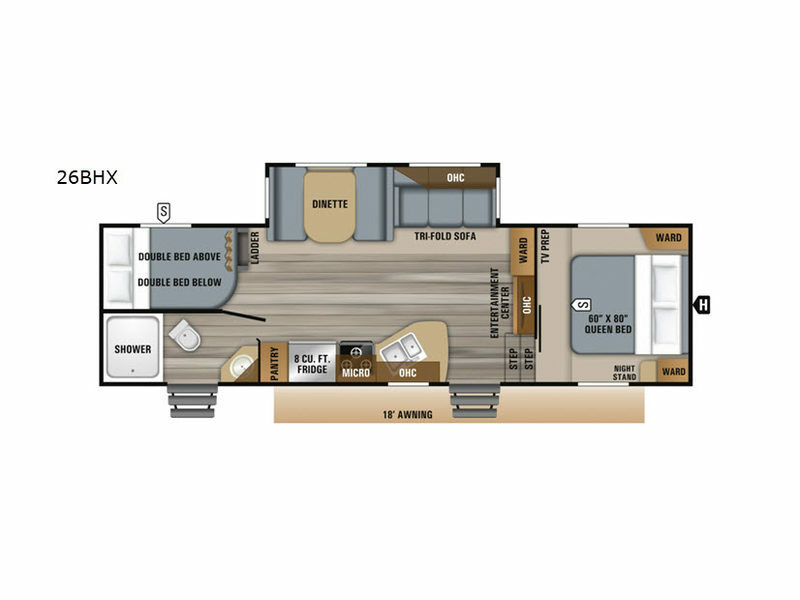 The double entry doors help keep a smooth flow of traffic throughout the fifth wheel. You can lounge on the tri-fold sofa and watch your favorite movie on the 39" LED HDTV in the entertainment center. At night, you can unwind and create memories with friends or family underneath the 18' electric awning with LED lights. For any camping trip you will want an Eagle HT fifth wheel by Jayco. Along the exterior there is a high-gloss, fiberglass front cap with built-in specialty LED lighting. Inside each model there are handcrafted Sugar Maple glazed drawers. Throughout each model there is Shaw residential carpet with a sound dampening carpet pad plus IVC Trekk wood-plank vinyl flooring. The industry exclusive HELIX cooling system is an added bonus with the Jayco-exclusive insulated duct design, directional and closeable A/C vents, larger return air vents, and the exterior-mounted 15,000-BTU Whisper Quiet A/C unit. The Customer Value Package includes a residential queen Simmons mattress with under-bed storage, an electric patio awning with integrated LED lights, MOR/ryde CRE/3000 rubberized suspension for a smoother ride, a rain proof EZ Breeze bathroom power vent, an industry first Go Power rooftop and ground solar prep, and so much more!